Elizabeth Allen's bold acrylics on canvas depict light and movement through the use of vivid colour and abstract design. Based on landscape, the images vibrate with energy. Broken colour and lost and found edges hint of the artist's vision while allowing viewers the opportunity to "complete" the images for themselves. Mystic and powerful, Elizabeth's paintings let you "see" in a way you may not have previously experienced. 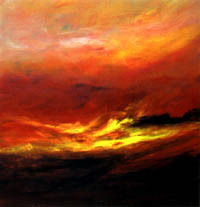 Elizabeth lives and paints in Victoria, British Columbia, on the west coast of Canada.